Hurray! This is the only request I have for the entire two weeks, to have someone buy spices and hibiscus tea for me. 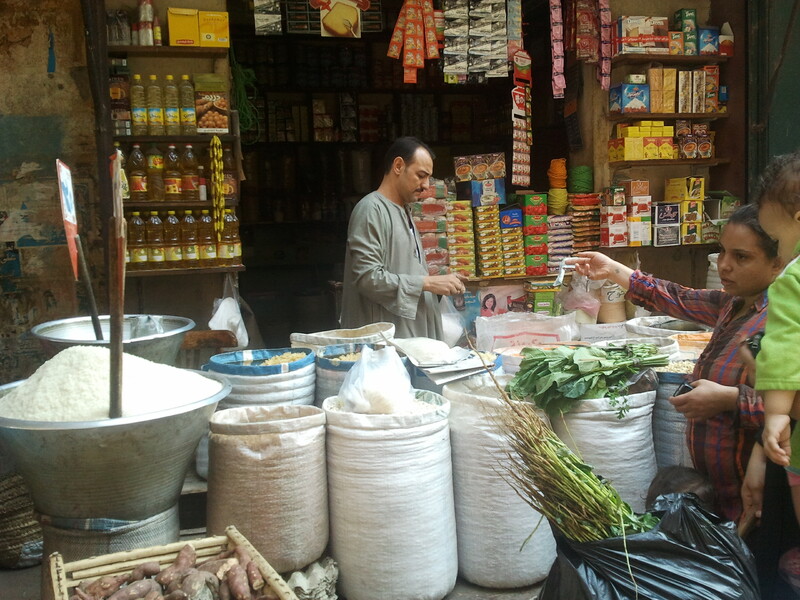 To be able to go to the souk myself – a local one at that, is a dream come true. At eleven in the morning we head out with one of Sister Marina’s friends, Nermeen. Sister Marina, Nermeen and Noreen are out for an adventure on a Sunday morning. Much to my surprise, the souk begins right outside the gates of the Salam Center. Soon after we begin our walk, I spot something that looks like coriander (cilantro) leaves, but they could be flat parsley – it’s hard to tell them apart. I ask what it is in Arabic. “Khosbara”, she says. Sr. Marina leads us down a block or two to a spice, rice and dried beans shop. She orders everything from the man in the shop. I walk over to a barrel of what looks to me to be coriander. What is this in Arabic? “Khosbara”, she replies. Bingo! I order hundred grams, a big bag of kerkaday (hibiscus tea) and a hundred grams of cumin. I don’t know how to say “chili pepper” in Arabic, so I use the word “pepper” and then point to my mouth and pant. Aha! I leave the shop with fifty grams of chili pepper as well. All this for fourteen Egyptian pounds, about €1.50, or about $2.00. Mission accomplished. We saunter back towards the center. Sr. Marina stops in a mobile phone shop to ask about something. 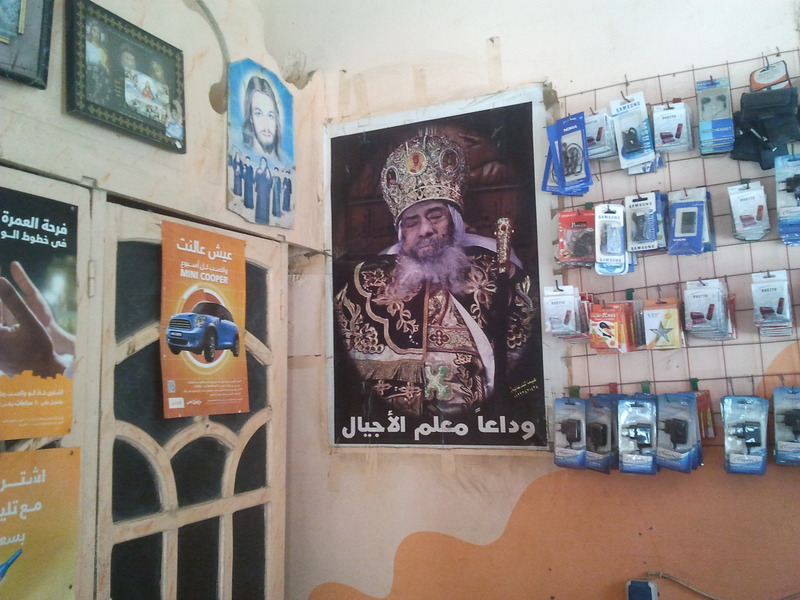 In the shop, I notice posters of Pope Shenouda, Jesus, Mary and various saints. I make a mental note of it. I’m in a Coptic shop. I see a strange-looking red fruit or vegetable. It turns out to be dates, which come in various colors. 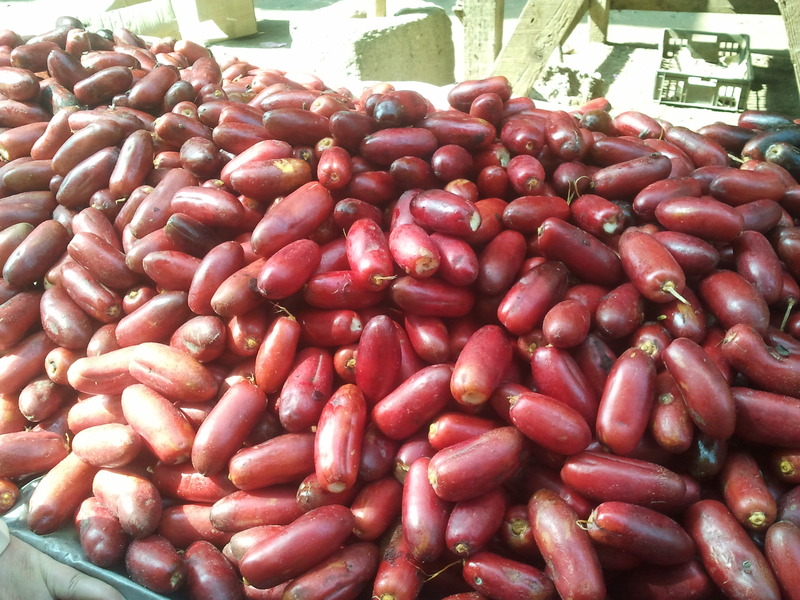 I later learn that red dates are Sister Maria’s favorite fruit. Once outside, as we pass a spice shop much closer to the center, I ask Sister Marina if the shop we bought the spices in is owned by a Copt. She nods her head. 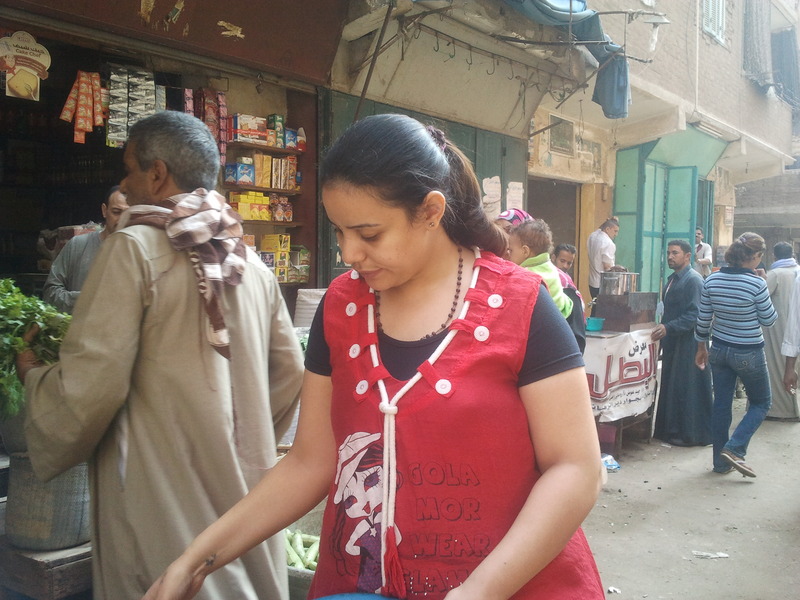 Just as I’m about to jump to the conclusion that all the Copts mark their shops with their posters, and that the Center only shops with the Copts, she stops at a cucumber stand where Muslim women are shopping. By now, I think I can tell the difference. There is a bit of haggling about something, but soon we leave, and Sr. Marina is content. She’s even purchased some sweet potatoes for me when I mention that I love sweet potatoes. After we arrive back at the center, Sr. Marina announces that we’re going to visit a church. We head out onto the street again. 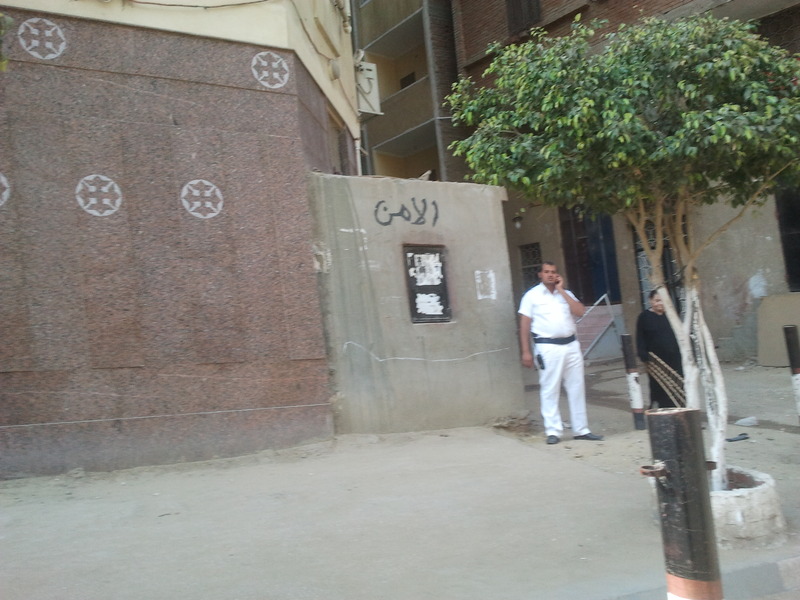 I notice that the building adjacent to the Salam Center has a loudspeaker. This must be the source of all those deafeningly loud calls to prayer that wake me up at 4:30 in the morning, and sometimes keep me awake. I ask Sr. Marina where the mosque is. That’s it – the building next to the center. “Two mosques,” she says, and points down the street. That’s what I’ve been thinking – that there are two mosques near the center. Apparently it is a long walk to the church, because Sister Marina tries to hail down a tuk-tuk. We struggle inside, three women with generously padded hips, trying to fit onto a seat built for two. I notice that the driver has a picture of Pope Shenouda on the windshield. 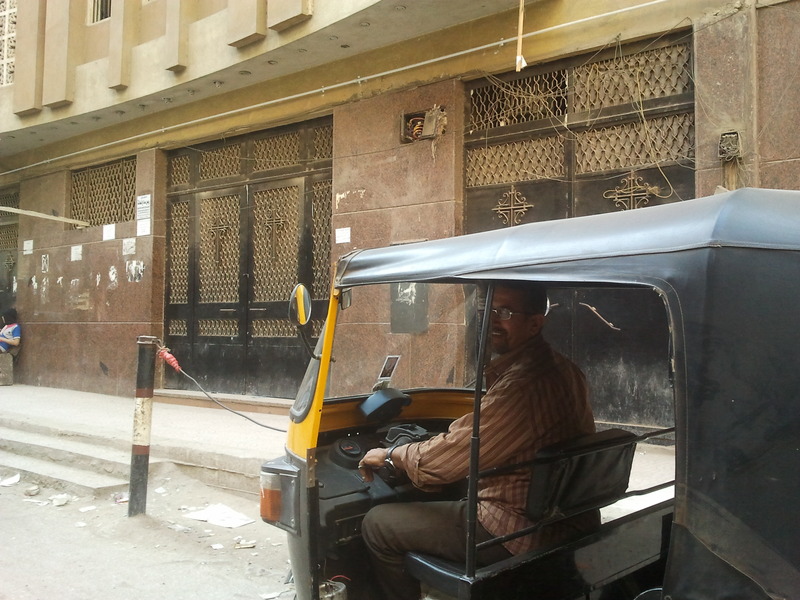 A Coptic tuk-tuk. Before we even have a chance to get started, two menacing-looking young men accost the driver and Sr. Marina. I have no idea what the problem is, but Sr. Marina and Nermeen decide this ride is not worth getting into trouble over. We walk to the church, which is about a half hour away. This church, Abousefin, says Sister Marina, is the local church, the one the sisters worship at when the priest doesn’t come to the center. When we first walk into the building I notice a huge lobby. Its vastness reminds me of the mega-churches in America, with their huge everything. There is a huge poster of some man hanging on the wall. In contrast to those of Shenouda and other popes and saints, this man is dressed in a suit and has no beard. I notice that at the back of each of the three sanctuaries, where there are icons (paintings of saints and various popes), there are also glass cabinets with embossed velvet objects. Sister Marina stops before one of them and kisses the cabinet. “Santa Marina,” she says, her eyes dreamy, her voice reverent. They lead me through the entire church, a seven-story building. Each of the three is nearly identical except for the saints honored in each one. Occasionally Sr. Marina and Nermeen touch a picture reverently or kiss a cabinet holding relics of saints they’re particularly fond of. The other day when I was walking with Sister Elleria to the hospital, a postcard with a picture of Joan of Arc happened to slip out of a folder and fall to the ground. She almost jumped to pick it up. “Who’s that?” she demanded. “Joan of Arc,” I answered. I was only carrying the postcard in case I’d be giving a talk to women. Then I could possibly have used the card to illustrate Joan of Arc as an example of someone who knew her destiny and had the courage to go “outside the box” to fulfill it. I’d already given the talk, and hadn’t even used the card, so I handed it to Sister Elleria, who held it reverently. In her lab, where she analyzes blood samples, we sat and talked. She has a poster of various saints in her office. She explained each one to me. She tried to explain to me why studying, thinking about, imagining the faces of, and talking to the saints is such a wonderful thing. Judging from her beautiful, soft, glowing, cheerful eyes, she must have an advantage over me. I see this same phenomenon today in Sister Marina and Nermeen, who often look dreamy-eyed as they kiss this cabinet and brush this picture or that. We come across some red velvet curtains shutting off the altar areas. Each curtain has beautifully sewn, glittery appliqués depicting St. George and St. Mark. 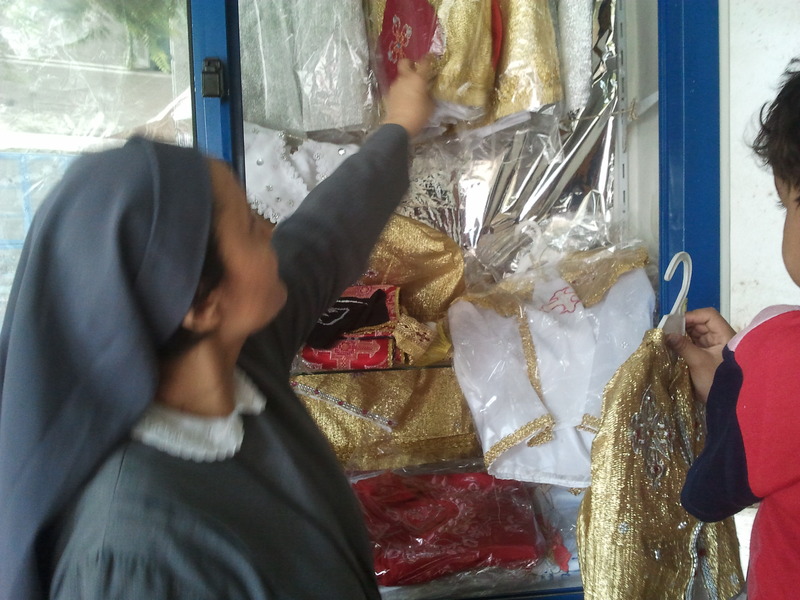 I learn that Sister Amina of the Salam Center has designed and sewn these marvelous pieces. An elevator attendant takes up seven stories, to the baptistery. 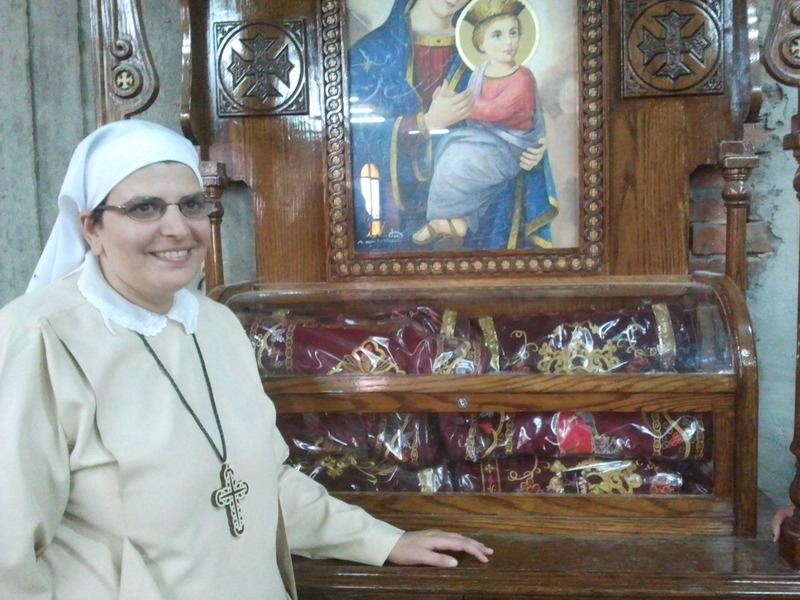 Sr. Marina introduces me to the priest, a man with those same soft eyes I am seeing everywhere I encounter Copts. We leave the church. Outside the church, I spot a soldier, dressed in the white uniform they wear during the summer months. Later, after my return to Germany, I learn that this church was attacked by Islamists a few months ago. When they arrived at the church, a crowd of people, both Muslims and Christians, formed a line in front of the church to protect it. The Islamists didn’t fire. They tried a second time, and again people around the church formed a human shield. This time, though, the Islamists found a man who had a picture of Mary in his workshop. They killed him. I wonder if the man whose photo I saw isn’t the man who was killed by the Islamists. Sr. Marina stops a tuk-tuk driver. We climb in. Another Coptic tuk-tuk, but this time we actually get to go somewhere. We’re off to another church or two. This is my first tuk-tuk ride ever. The time I went whitewater rubber rafting a few years ago with my nieces and nephews was not more exciting than this. Our hips alongside one another are simply too wide to fit into the seat. Nermeen motions for me to sit on her lap. I sit there, my head almost bumping the roof, so I lean over the driver and hold on for dear life. We laugh a lot on our joy ride to the church. The church, the one they call a cathedral is nicknamed Santa Maria by the metro stop (Ezbet El Nakhl). We’ve been in the same neighborhood as the Salam Center all this time! The church is actually two churches across the street from one another. One of the buildings has a bookstore, and Sister Marina shows me a book with Soeur Emmanuelle, the founder of the Salam Center, on the cover. How I wish I could have met her! After my return to Germany, I listen to an interview with her in French, and she sounds so lively, so human! But seeing her photo, I feel I have a connection to the founder of the Salam Center, as well as to those living there now. Unfortunately, the bookshop is closed. Again, I notice Sister Marina and Nermeen kissing and touching a lot of pictures. In one of the churches, again separating the sanctuary from the altar area, there is another beautiful appliquéd curtain. It’s the Virgin Mary. I am particularly struck by the beautiful work on Saint Mary, as well as her soft eyes. Again, the seamstress was Sister Amina. Sr. Marina, Nermeen, and I reverently touch the curtain. In the cathedral church of Saint Mary, there is an icon of Saint Marina. I take a photo of Sister Marina next to her favorite saint. I ask her who gave Sister Marina her name. She stops, turns to me, looking at me with soft eyes, and says in a hushed tone, “Father Shenouda”. It was the Pope himself who blessed her, who gave her her habit, her cross, her name. Five other sisters at this convent received their names from him at the same time. We look at the pictures of the twelve apostles at the front of the church. Unlike the gothic paintings or statues of the various saints I see in Catholic churches throughout northern Europe, these saints all look wonderfully kind, soft, and gentle. I think the Copts must value kindness and gentleness above everything else. They study and collect pictures of the lives of these saints like teenagers collect pictures of sports or movie stars. The difference is, the saints are truly positive role models. 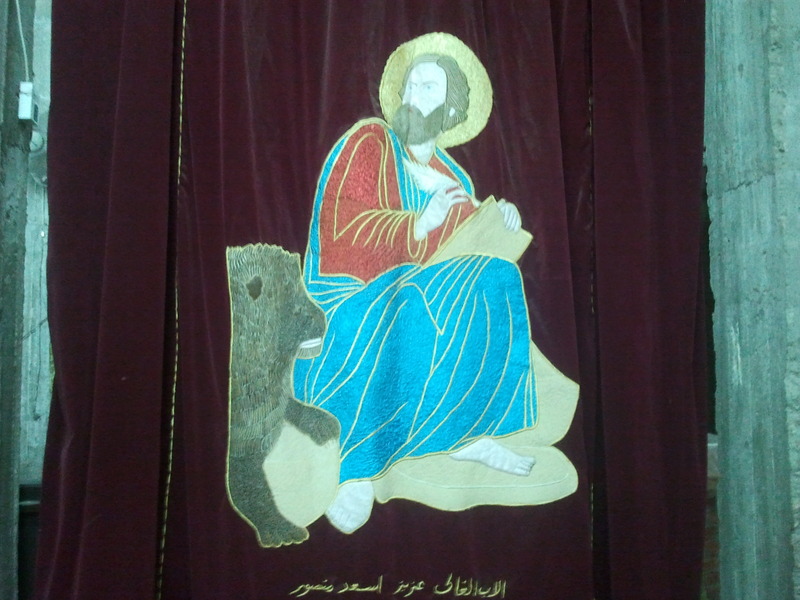 At this moment I wish I had grown up in a Coptic culture rather than in a sober, icon-less Protestant church. We look at a large photo hanging on the wall of a man from our time. He’s a priest, says Sister Martina, who was shot dead by Islamists. A martyr. “I fear for you all here,” I tell her. Sister Marina’s cell phone rings. It is Sister Maria. They talk for a minute or two and then Sr. Marina hangs up. “I love Mother Maria,” she says in English and again in Arabic. We’ve been practicing the phrase “I love…” Nermeen nods her head. “Me too.” I agree. Me too. It’s time to go back to the convent. We’re all hungry. We find another tuk-tuk. We bump and jerk along dirt streets and avenues until we reach the center. And then a nasty scene takes place. The driver is not content with the money Sister Maria has paid him. Nermeen and I each offer to contribute some money of our own, but Sr. Maria won’t let us. “He got the same amount as the other driver – five pounds.” Judging from his face, I’m hoping there won’t be a terrorist attack on the center. Sister Maria later tells me that he wanted more money because there was a foreigner in the group. Whenever there are foreigners present, people want more money. Back at the center, we find Sister Amina still seated at the table, finishing her lunch. 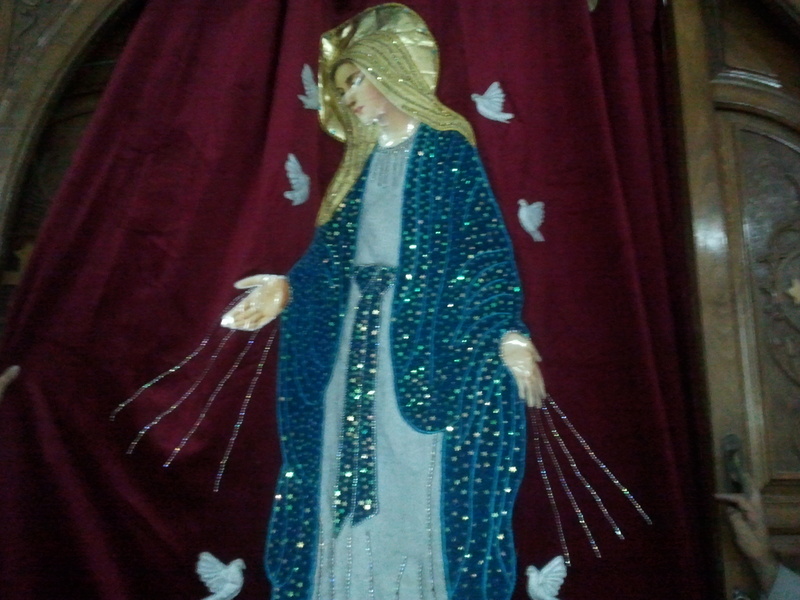 I show her the photograph in my cell phone, her depiction of Saint Mary. She looks at it, smiles, kisses my cell phone and hands it over to another sister who wants to see the photo. She also looks, smiles, and kisses it, without a hint of embarrassment or shame. I don’t understand this culture, but I like it.